On Easter Sunday 2013, the day before "Bedroom Tax" was to be rolled out, Paul Morrison from the Methodist church, speaking on behalf of a coalition of churches (Baptist Union, Methodist church, United Reformed church, Church of Scotland) spoke out against the economic attacks and the propaganda war against the poorest and most vulnerable people in society being conducted by the current government. He was highlighting a report by these churches called "The Lies We Tell Ourselves: Ending Comfortable Myths About Poverty" (which is well worth a read). This criticism of government welfare policy comes just a couple of weeks after the new Archbishop of Canterbury slammed the government for their policy of inflicting real terms cuts on benefits for the unemployed and the working poor alike (and their families) in a letter to the Telegraph signed by 43 of his Bishops. "The British public has come to believe things about the poorest in our society which are just straightforwardly not true. 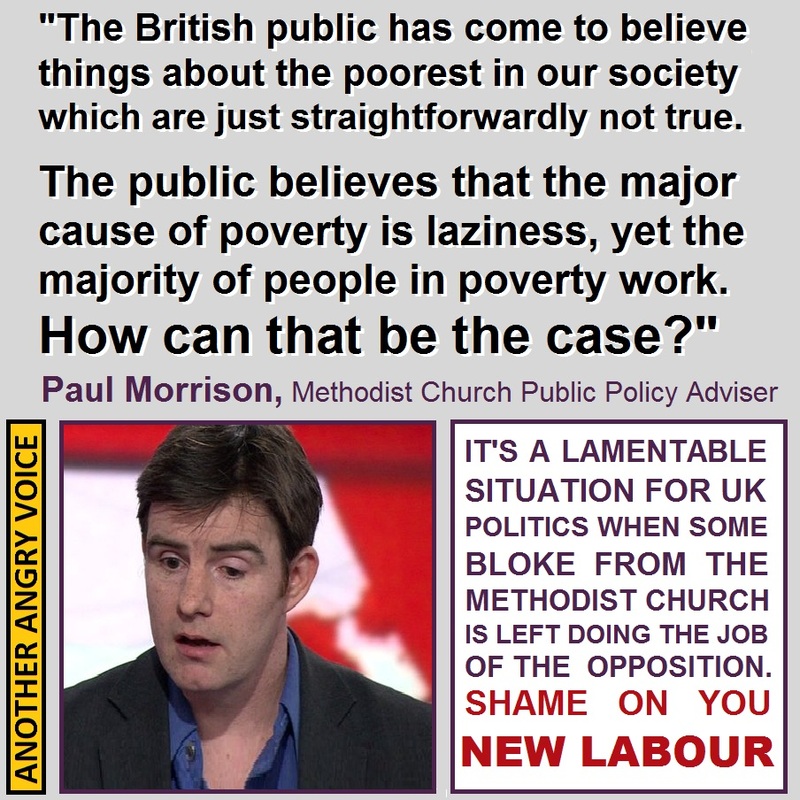 The public believes that the major cause of poverty is laziness, yet the majority of people in poverty work. How can that be the case?" "It is an understanding of people that they somehow deserve their poverty, that they are somehow 'lesser', that they are not valued. The churches believe that they are valued and we believe that they should be treated much more fairly than they are being." "We saw that people who we value, who we believe God values and God loves, we saw them being insulted day in and day out in the media, and that needed to stop. The consequence of the attitudes towards the poor is that welfare cuts like this become more acceptable, so it's right that we criticise that too." Whatever your stance on God and organised religion, it is worth noting that these churches have collaborated to do what they think is right. They have decided to put their doctrinal differences aside and collaborate in order to defend the poorest and most vulnerable people in society, not because of a tribalist desire to protect their own kin, but because they believe that they have a moral obligation to do it. The Tories obviously countered these criticisms with a load of cherry-picked statistics, "making work pay" narratives and "scapegoating of the workless" aimed at building public support for their malicious economic attacks on the weakest members of society. Using the technique of stirring a sense of injustice that "layabouts" are getting more than hard working people is an effective (if utterly revolting) propaganda technique because the sense of injustice is one of the most powerful human emotions. Telling working people that they are getting less than a bunch of "idle scroungers" is a deliberate attempt to build support for their economic attack programme against the poor by stoking the sense of injustice. People become so incensed at the cited unfairness, that they don't even bother to think about the implications of real terms benefits cuts for everyone of working age, before deciding their approval. 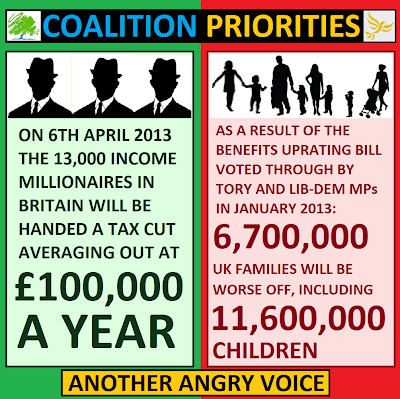 Many people allow themselves to get so caught up in the injustice of "idle scroungers and hard workers" that they'll approve cuts to their own family budget, since the vast majority of welfare payments go to ordinary working families (Working Tax Credit, Child Tax Credit, Housing Benefit, Council tax Benefit, Child Benefit, Maternity Pay, Paternity Pay, Sick Pay). People allow themselves to get so wound up about a tiny minority of "idle scroungers" that they don't even consider that the right-wing "scrounger narratives" are being used to justify much wider real terms cuts to all of the aforementioned benefits which largely go to the working poor. The "making work pay" narrative is utterly flawed becuase the vast majority of benefits being cut are benefits that are paid to the working poor! By thrusting the working poor deeper into poverty with their real terms cuts to working benefits, they are actually reducing the incentive to work! Another problem with these lame Tory ripostes was actually raised by Paul Morrison in the comments that the Tories were trying to rebut. Responding to a statement that the majority of people in poverty (and receiving benefits) are not unemployed, but actually members of working families with yet more "scrounger narratives" and scapegoating of the unemployed, is beyond disingenuous, it's an implicit acceptance that they have nothing to offer the debate but more of the same kind of propaganda that is under criticism in the first place. Another problem with the Tory appeal to unfairness in order to build support for their "slash benefits to make work pay" strategy is that the best way to "make work pay" is actually to ensure that working people get a decent living wage. If the government increased the National Minimum Wage to make it a living wage, they could cut £billions from the welfare bill through reductions in subsistence benefits for the working poor (Working Tax Credits, childcare subsidies, Housing Benefit...). The reason the government won't take this common sense approach is obvious, they won't enforce decent living wages in order to cut the welfare bill, because making corporations pay decent wages would conflict with the true Tory party agenda of serving corporate interests. The Tories won't increase the National Minimum Wage in order to reduce state subsidisation of the corporatations that pay poverty wages, just as they won't reduce the state subsidisation (via housing benefits) of the private rental sector by introducing rent caps and forcing private landlords to comply with the same regulations as the social housing sector. Their agenda isn't to reduce welfare spending at all, it is actually to ensure that ever greater amounts of state spending go towards the subsidisation of wealthy Tory voters and especially the millionaire financial backers of the Tory party. The most grotesque element to the government loading the poor and vulnerable with the burden of their failing economic austerity experiment, is that with the other hand they are lavishing the already wealthy with tax cuts, corporate welfare schemes and tax loopholes. All of their rhetoric about the importance of cutting welfare is not only invalidated by the dodgy and inaccurate rhetoric they resort to, it is invalidated by the fact that at the same time they insist that welfare must be cut, they are planning ever more handouts to the wealthy. In the very same week that the collective punishment of social tenants ("Bedroom Tax") is initiated, the 13,000 highest earners in the UK are to be handed a £2,000 a week tax cut. It is absolutely obvious that Christian ethics are fundamentally incompatible with modern Conservativism. It would take a mind-boggling amount of cognitive dissonance to believe that it is possible to follow the teachings of Jesus (charity, equality, compassion...) yet approve of hardline greed worship and materialism in the form of neoliberal economic doctrine as adhered to by the Tory party. The various churches haven't been so bold as to state the obvious; that the Tory government is brazenly serving the interests of the rich at the expense of the poor and vulnerable and that modern Conservativism is fundamentally incompatible with the teachings of Christ. But it is still a noble endeavour to defend the interests of the poor and vulnerable and to counter the propaganda strategies of the Tory party and the baying right-wing press. Even though, in my opinion, these religious condemnations of the Tory agenda doesn't go far enough, it is great to see that these various religious organisations have finally begun waking up to what the current government is doing, and stirring themselves into action. The monthly unemployment figures for March were snuck out on the same day as George Osborne's headline grabbing 2013 budget. Whilst millions of people ended up talking about the 1p a pint reduction in beer duty, virtually nobody discussed the ongoing long-term and youth unemployment catastrophes. The figures revealed a 53,000 rise in the number of 18-24 year olds out of work over the previous three month period, bringing the total to 800,000. To put this into perspective, there has been a near doubling of youth unemployment since before the global financial sector meltdown (from 457,000 in the March 2006 Labour Market Statistics). The situation with long-term unemployment is even worse. The total for people out of work and claiming benefits for longer than 12 months has risen from 329,000 in 2006 (before the financial sector meltdown) to 887,000. A 170% rise. Those out of work and claiming benefits longer than two years has risen even more dramatically from 163,000 to 451,000 (+177%). 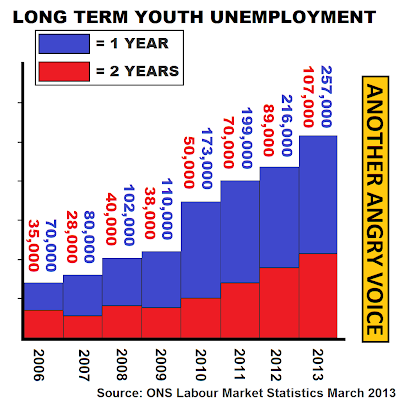 The story is even worse when it comes to long-term youth unemployment. On the 12 month+ measure, youth unemployment has risen 267% since 2006 and on the 24 month+ measure it has risen from 35,000 to 107,000. Firstly: The tens of thousands of benefits claimants being herded onto Iain Duncan Smiths unlawful Labour party approved workfare schemes are not included in the official ONS unemployment figures, meaning that for each three month period the number of people receiving unemployment benefits and out of paid work is something like 70,000 - 100,000 higher than the official figures imply. This is not some crazy conspiracy theory, it has been admitted several times in official ministerial replies and parliamentary debates. Secondly: It is absolutely clear from whistleblower testimonies from several Jobcentre workers over the last two years (1, 2, 3) that Jobcentre staff are being assessed on what proportion of people they are stripping of their unemployment benefits. The existence of sanctions league tables and official targets for stripping people of their benefits is undeniable (even though Tory ministers like Iain Duncan Smith and Mark Hoban continue their absurd evidence denying, counter-factual denials). New evidence has also come to light that Jobcentre managers are being threatened with disciplinary measures if their staff don't strip enough people of their benefits, and that they in turn, are threatening their own staff with disciplinary measures for not meeting the targets specified by DWP management. The reason that this is important is obvious, if each Jobcentre is being pressurised into sending 5% of claimants for sanctions each month, this is going to have a huge cumulative effect on the overall unemployment numbers over the course of a year. By incentivising Jobcentre staff into tricking the most vulnerable people into losing their benefits. It's much easier to trick someone vulnerable (heavily dyslexic, autistic spectrum, very low IQ, suffering extreme depression or stress, recovering from stroke or brain injury) into committing a Jobseeker's Agreement violation than it is to catch out a "dedicated dole scrounger" or trick them into committing a sanctionable infringement. Another factor to consider is that even small violations resulting in a 4 or 6 week sanction can have a major effect on the long-term unemployment stats, since the claimant may not bother to sign on for the sanction period (for which they receive no benefits anyway), but return to initiate a new claim when the sanction period is over, therefore removing themselves from the long-term unemployment calculations. Government gaming of the unemployment stats has been going on for decades, but the sheer scale of the measures being utilised in order to create the fiction that unemployment isn't a problem is worse now than it's ever been. I mean, introducing retroactive laws to deny recompense to those that have been unlawfully coerced into doing mandatory unpaid labour at major profit making (often foreign owned) corporations is bad enough, but maintaining the fiction that these people are not even unemployed is even worse. Even if they are doing unpaid labour, they are still actually receiving unemployment benefits! The alarming rise in long-term and youth unemployment has had catastrophic real life consequences for millions of people. Unimaginable numbers of real people, though no fault of their own, have found themselves living on meagre subsistence benefits and castigated by their government, the baying right-wing press and their fellow countrymen as "scroungers", "skivers" and "parasites". Yes there is a small minority of truly dedicated dole scroungers, but every time you fixate on them in a discussion, you're fighting the propaganda war of the Tory party for them. Large increases in unemployment and long-term unemployment are obviously not the consequence of hundreds of thousands of people suddenly, simultaneously deciding to have "an easy life" on benefits, it is a consequence of macroeconomic issues (financial crises, credit crunches, barmy ideological austerity experiments, influxes of cheap foreign labour, influxes of cheap foreign imports... ). Anyone pointing at their anecdotal lazy neighbour as an explanation for the unemployment crisis is a fool who has absolutely no grasp of the bigger picture. Due to severe cognitive limitation, confirmation bias or deliberate ignorance, they chose to blame the unemployed for their own situation, rather than blaming the self-serving politicians who have en masse abnegated their responsibility to make sure the social destruction of mass unemployment is avoided, in order to serve instead the interests of bankers, corporations, property speculators, super-rich party donors and the like in the hope of future kickbacks. Perhaps it is simply more comfortable to for these users of "scrounger narratives" to allow themselves to believe that they are important hard-working people being exploited by "opportunistic dossers", than to accept the reality; that in the view of "the Establishment" (bankers, politicians, the rentier class, corporate fatcats, quangocrats, thinktankers ...), that they themselves are utterly insignificant chattel to be ruthlessly exploited. It is easier for them to think of themselves as brave lions suffering ticks, than as just one of a gigantic herd of docile cows being milked for all they're worth by a profit driven farmer. Possibly the worst thing of all about the unemployment situation is the ridiculous stance of the Neo-Labour party. Instead of repeatedly hammering the Tory party (on long-term unemployment, youth unemployment, the catastrophic and eyewateringly expensive failure of their Work Programme, the unlawfulness of their mandatory labour regulations, the fact that Jobcentre staff are being actively incentivised into bullying vulnerable people off benefits), they actually colluded with them to pass a bunch of retroactive legislation through parliament at lightning speed to cover up Iain Duncan Smith's blundering incompetence. The fact that the Democratic Unionist Party of Northern Ireland now stand to the left of the Neo-Labour party on unemployment and social justice should be enough to disbar them from ever even pretending to represent the interests of left-wing people until those responsible (Ed Miliband, Liam Byrne and Stephen Twigg) are removed from the party leadership. Labour should be nailing severaly limited, brazenly malicious, blunderingly incompetent and extremely unpopular figures like Iain Duncan Smith to the wall, not colluding with him to retroactively bury his latest hundred million pound mistake. 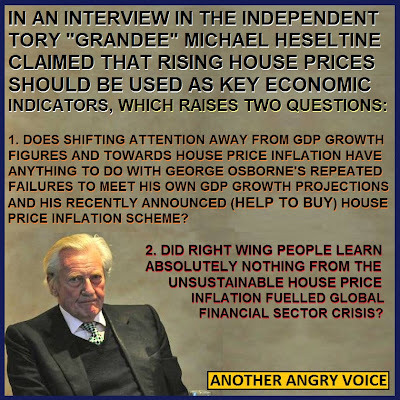 In March 2013 the one time minister in Margaret Thatcher's government, turned Tory party "grandee" Michael Heseltine gave a remarkable interview with the Independent newspaper in which he tried to pin the blame for Britain's economic woes upon the country being too "well off". I should start with a very brief biography for those of you that are a little younger than me that don't really know who Michael Heseltine is. He was a leading member of Margaret Thatcher's government but fell out with her in 1986. He challenged Margaret Thatcher for leadership of the Tory party after Geoffrey Howe's resignation in 1990 in the wake of the Poll Tax fiasco. He polled well enough in the first ballot to deny Thatcher an outright win, but he was defeated by John Major in the second ballot. He then joined John Major's cabinet serving in several roles including deputy leader of the Tory party. He is remembered with great enmity by many Tories for having played such a crucial role in the removal of Margaret Thatcher. In 2001 he retired from the commons and was immediately given a peerage in the House of Lords. It wasn't until almost 10 years later, having been appointed as an adviser to the Treasury, that he bothered to give his maiden speech in the Lords, to deliver his report on the UK economy and industrial performance. "It's a question of whether the national will is there; whether we want it. And the richer you get the less imperative there is ... Maybe one of the problems of advanced economies is that people are sufficiently well off that they don't need to drive themselves any more." He seems to be implying that once a nation gets to a certain level of wealth the population become lazy and unmotivated. There are several flaws in this kind of view. I'll outline just a few of them. 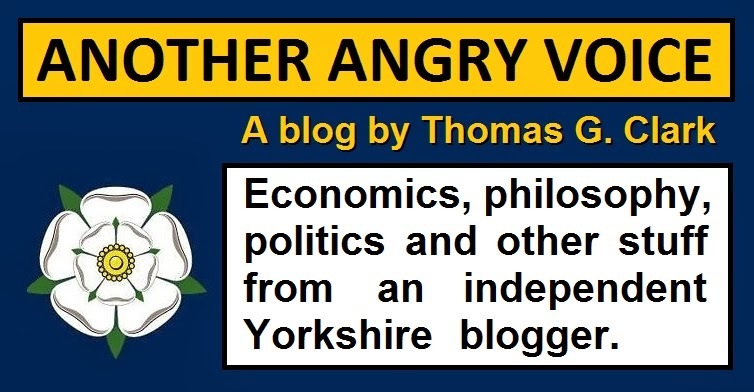 The first and most obvious criticism is that the view that "the richer a person gets, the less imperative there is for them to drive themselves" contrasts terribly with Tory philosophy and policies. If there is any truth to Heseltine's claims, then the Tory policy of handing an average £100,000 a year tax cut to Britain's 13,000 income millionaires (due on April 6th) would actually reduce their imperative to drive themselves wouldn't it? One can assume that Heseltine was not trying to say that the wealthy establishment have it too easy, but instead that he's implying that the general population have it too easy. 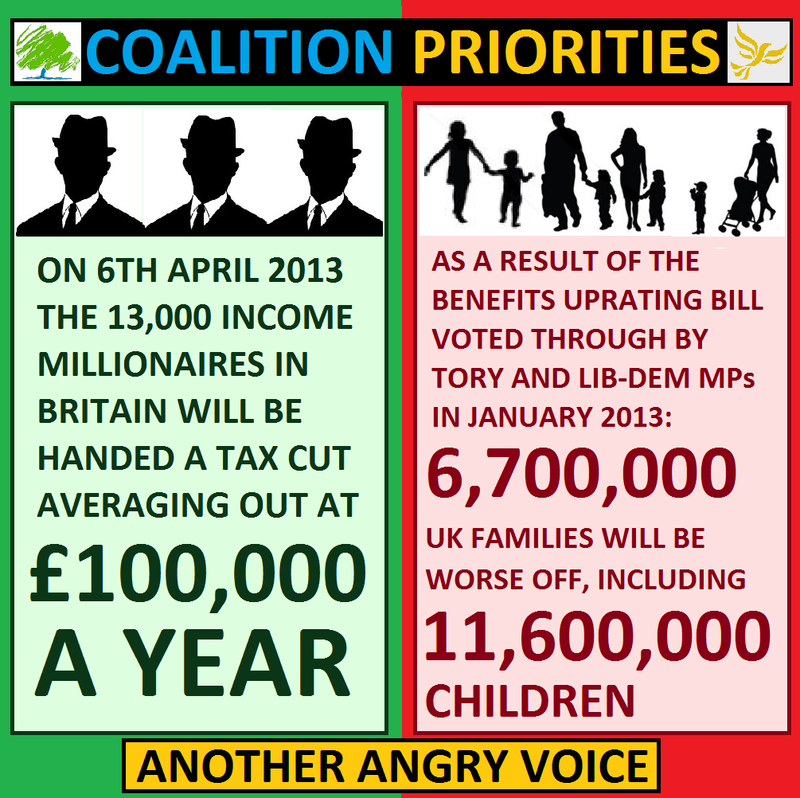 That decent welfare provisions and high wages for "the plebs" is the problem. That productivity could be improved by squeezing ordinary working people harder and rescinding more of their welfare provisions. This interpretation fits with the Tory austerity experiment and the fact that wages have declined in real terms every single month since the coalition came to power. If we interpret Heseltine's view this way (that "the bloody plebs have it to easy"), at least his comments actually fit with the Tory ideology of attacking labour rights and destroying welfare provisions, whilst increasing the wealth of the wealthiest. But this still leaves us with the problem of how greater wealth for ordinary people makes them lazy and complacent, yet greater wealth for the already wealthy is a fundamental element of the Tory ideology. I believe that Heseltine's comments are actually a carefully disguised reworking of the idea that Britain must parse wages, labour rights and welfare provisions for ordinary people down towards Chinese and Indian levels in order to remain "competitive". Of course the low labour costs and abysmal labour rights of ordinary Chinese and Indian workers play a huge part in their high relative productivity. However, it is adherence to right-wing neoliberal economic ideology that makes this production cost disparity such a threat to the Western economies. Were the UK to introduce capital controls in order to prevent the UK economy being flooded with cheap Chinese imports for example, UK industry and manufacturing would benefit enormously and the incentive for companies to outsource production to Asia would be significantly reduced. One of the main drivers of the Chinese boom has been inward investment in infrastructure. In little over a decade, they have built a motorway network larger than the US interstate network, they've constructed hundreds of millions of houses, massively advanced their scientific capabilities and their space programme and set about building a bullet train network. In contrast, one of the first things George Osborne did when he got into power was to brutally slash UK capital investment. While China spends ever greater amounts on infrastructure, housing, education and science, the UK government have been cutting spending on all of them. British infrastructure has suffered from decades of neglect, yet instead of investing in infrastructure improvements, the Tory led government, like their Labour predecessors, are more interested in corporatisation of the state via ludicrous corporate outsourcing deals, PFI economic alchemy scams and state subsidised privatisations. The reason the UK is in comparative decline is that the economy has suffered from 34 years of neoliberal pseudo-economics and an abject lack of coherent economic planning. I'm not the only one making this point, recently more than 60 economics professors wrote a letter condemning George Osborne's mismanagement of the economy. Another problem with Heseltine's view that the UK is being left behind because the plebs are too comfortable is the fact that as a proportion of GDP, the wages and wealth of British workers has plummeted. British workers are worse off now, in terms of disposable income, than they have been for decades. The only way we're better off is through the exponential improvements in technology, in almost every other aspect of our lives we are significantly worse off than we were 40 years ago: Wages are lower in real terms; we have less job security; Quantitative Easing has eroded our pensions and savings; rents are higher in real terms; childcare is more expensive; utility bills, fuel prices and public transport costs have soared above the rate of wage increases for decades; and the public are more indebted than ever before. If wealth makes us less productive, then this great reduction in disposable income should have made us more productive, yet it absolutely hasn't. 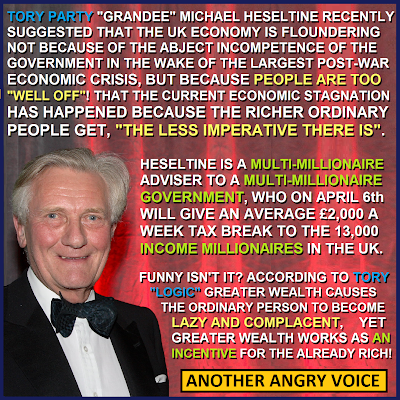 It seems Heseltine has got it completely backwards. The greater the levels of disposable income available to ordinary people, the more productive we become, since disposable income creates economic demand and provides people with the capital necessary to start small businesses (which are powerful drivers of economic growth). One more problem with Heseltine's view is that there are many countries which have significantly higher wages and better welfare provisions than the UK, which have weathered the economic crisis much better than we have. The Scandinavian countries are the obvious examples, but other countries like Australia and Canada have significantly higher median wages, and although they are hardly booming in the wake of the global financial sector meltdown, they are not languishing in desperate economic stagnation like the UK. Surely if Heseltine's view that coddling ordinary people with decent wages makes them lose their imperative to drive themselves, then these higher wage economies would be struggling even more than ours? Heseltine's comments about Britain's lack of "national will" were bad enough but he also made a number of other ridiculous comments that are worthy of deconstruction. One of his comments echoed the Tory narrative that GDP figures are not very good economic indicators. I actually agree with him on that, there are much better economic indicators (the balance of trade, average disposable income, average personal indebtedness), however the things he proposed as alternatives are frankly ludicrous. His first suggestion of "rising employment" wouldn't be so bad but for the fact that everyone knows that the headline unemployment statistics have been rigged and distorted so much by successive administrations that they are virtually meaningless. To give just one example, the ONS actually exclude the 10,000s of people on mandatory unpaid "workfare" schemes from the official unemployment statistics, despite the fact that they are earning no wages and still in receipt of unemployment benefits! If these people were included in the unemployment statistics, then the headline unemployment figures would be significantly worse. It is also important to note that long-term unemployment and youth unemployment are both continuing to soar out of control. Heseltine's second suggestion demonstrates a staggering level of economic illiteracy. He stated that house prices should be used as indicators that the economy is recovering. If we use house prices (rather than GDP, balance of trade, disposable income, indebtedness, industrial productivity...) as one of our key economic indicators then the absurd situation is created that a massive house demolition programme would supposedly demonstrate economic recovery (due to restricted supply driving hose prices higher) whilst the construction of much needed social/affordable housing would demonstrate economic decline, as house prices fall back to more sustainable levels. It is an absolutely clear demonstration that the right-wing have learned absolutely nothing from the global economic crisis if they think that the health of an economy can be measured in the level of house price inflation! Perhaps they are so enamoured with the Great Neoliberal Lie they keep peddling (that the crisis wasn't caused by reckless under-regulated bankers, sub-prime lending, the construction of dodgy mortgage backed derivatives, Credit Default Swaps..., but actually by supposed "excessive state spending) that they seriously believe that house price inflation could be a positive economic indicator. I struggle to believe that they are so stupid as to believe their own "Labour caused the crisis" propaganda so there must be an alternative explanation. 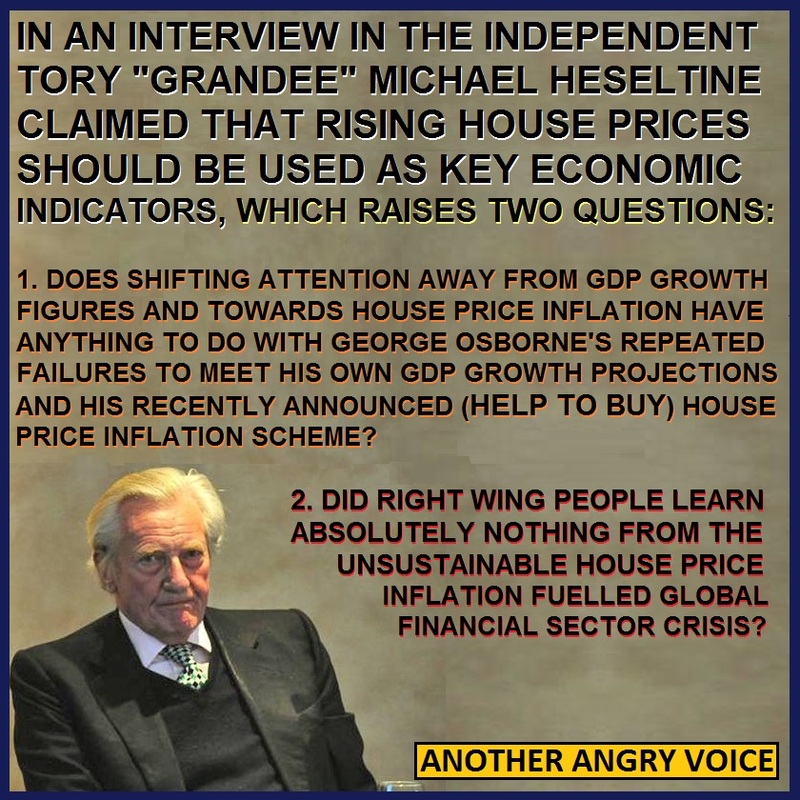 It seems no coincidence at all that Heseltine suddenly wants the economy to be judged on rising house prices, just days after George Osborne announced a massive (Help to Buy) subsidisation of the private housing sector which will undoubtedly cause a re-inflation of the house price bubble. It seems that Heseltine is simply cherry picking two supposed economic indicators that are certain to be massively influenced by Tory policy. The headline unemployment figures may well continue to fall as ever more unemployed people are coerced onto "workfare" schemes and misleadingly struck from the unemployment figures, whilst house prices are certain to rise once Osborne begins pumping £billions worth of subsidies into the market in 2014. I believe were going to hear a lot more of this kind of thing from the Tories in the buildup to the next election. We can expect them to point to their brazenly distorted headline unemployment figures and to the scale of subsidy backed house price inflation as their key "economic indicators" because they'll be virtually the only seemingly positive economic indicators they'll be able to dig out. Sadly, millions of people are so cretinous that they'll allow themselves to believe in the government unemployment figures, just as they'll believe, against all of the evidence of the global financial sector meltdown, that house price inflation is suddenly a wonderful thing again. 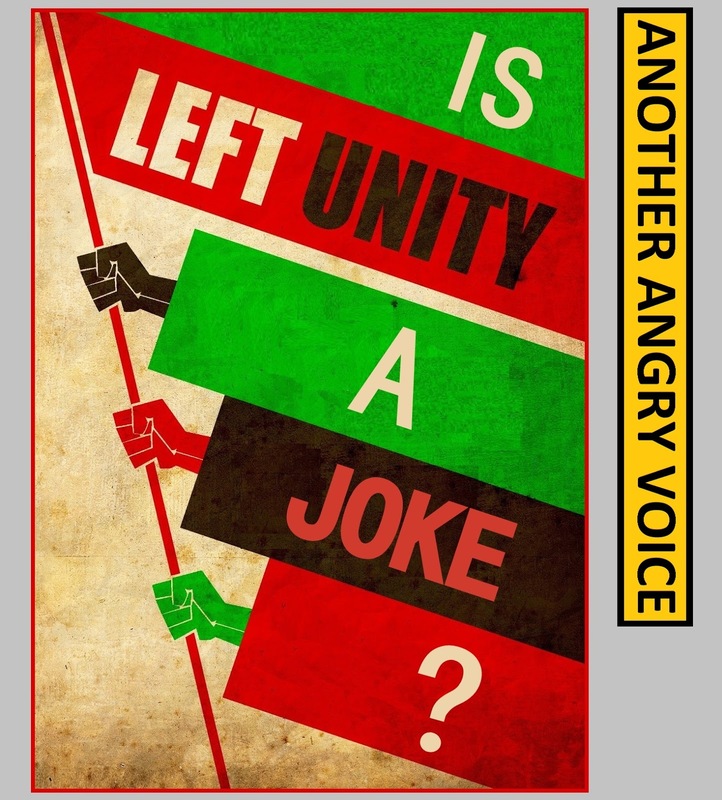 Left Unity, is it just a joke? In recent months there have been numerous calls for "a new party of the left", most notably from the film director Ken Loach. That there is no mainstream political representation for those that place themselves in the left-liberal quadrant of the political spectrum is more clear than ever. Labour abandoned this territory in 1994 when they allowed Tony Blair and Gordon Brown to usurp the party and set about their 13 years rule of privatisations, dodgy PFI scams, bank deregulations, imperialist warmongering and attacks on our civil liberties. The Liberal Democrats tried to cash in on this Labour betrayal by posturing as a left-liberal party, but abandoned this stance as soon as they got a whiff of second hand Tory power. It is beyond question that all thee establishment parties are adherents of centre-right orthodox neoliberal pseudo-economics, all three are grotesquely illiberal (detention without trial, secret courts, internet snooping, retroactive legislation) and all three are riddled with selfish, self-serving, expenses scamming career politicians. There is a huge amount of popular dissatisfaction with the political establishment, but the problem of course is that for the last few decades "the left" has been riven by factionalisation. 19 years after the Labour party abandoned socialism and 16 years after Neo-Labour rose to power, other than George Galloway, Caroline Lucas and a few old school Labour "leftie die-hards" like Dennis Skinner and John McDonnell the left has had no representation in Westminster. The project to unify the left and create a new political party seems like an interesting and worthwhile project. Even to people that do not share particularly left-wing sentiments must find it difficult to oppose the idea of more political plurality. If the right-wing have the choice between extreme-right UKIP and the three right-wing establishment parties, surely the left need more choice than just the Green Party and the Respect party (which will always be overshadowed by George Galloway). I decided to check out the "new left" project by visiting the The Left Unity website, but the very first article I stumbled across was one entitled Just how left wing is the Green party? Which starts out reasonably well, but soon descends into the construction of a tribalist division between the Green party and the "new left". "Those of us outside the [Green] party often point to the record of the Greens in Germany, where the party joined a neo-liberal coalition and voted for the Afghanistan war, and in Ireland, where they joined a right wing government and cut healthcare and benefits while saying it was OK because they were creating new cycling schemes." It is obviously unfair to judge the Green party in the UK by the actions of other Green parties abroad, especially when there are plenty of examples of other national Green party groups that haven't sold out to neoliberalism (Italy, Turkey, Greece, Catalonia, USA). It's also a bit rich for "the left" to be criticising the Greens by citing a couple of examples of Green party groups in other European countries have sold out to the neoliberal economic orthodoxy, when they allowed the main left-wing group in this actual country (Labour) to be usurped by orthodox neoliberalism almost two decades ago. The supposed party of the left then enforced the neoliberal establishment orthodoxy for 13 long years. 13 years in which they not only failed to reverse the work of their Tory predecessors, but actually served as the neoliberal establishment and continued the lunacy of financial sector deregultaion, housing neglect, state sell-offs, corporate outsourcing, doggy PFI scams, extraordinarily lax tax enforcement, expenses fiddling and corporate warmongering. As a supposedly left-wing party Neo-Labour had a truly lamentable record, yet in this long 13 year period of left-wing betrayal, the "alternative left" in the UK was democratically represented by just two Scottish blokes, Tommy Sheridan in the Scottish Parliament and by George Galloway representing the Bethnal Green and Bow constituency in Westminster. One of the strongest criticisms of "the left" is that in two decades they have utterly failed to galvanise any kind of credible left-wing alternative to Blair's continued Thatcherisation of British politics. The Left Unity article then goes on to lambaste the minority administration Green council in Brighton for having made spending cuts. Even though the author of the Left Unity hatchet job openly admits that the scale of the cuts were forced onto the Green party by the Tory local government minister Eric Pickles and due to the fact that they only have a minority administration. Their minority rule allowed opposition Labour and Tory councilors to give the Greens an ultimatum to either enforce the cuts, or to quit their only local government administration in the whole of the United Kingdom. It is extremely harsh to criticise the Greens for actions that were forced onto them by the establishment parties, because even if they had quit the council and let Labour and the Tories form an anti-Green coalition (as the author of the article implies they should have done), the cuts would still have been made. All in all, the article was a disgrace. Instead of looking to the Green party success in Brighton as an inspiration and praising the tireless political work and social activism of the Green MP Caroline Lucas, the author used the article to launch an attack on the Green party and create divisions between them and this new left party that doesn't even exist yet! The whole idea of using a website called Left Unity to attack another left-wing party and to undermine the work of one of the only genuinely left-wing politicians in Westminster is so absurd and thoughtless that would make a very funny unwitting self-parody, were the abject lack of representation for the liberal left not such a serious issue. Judging by the feeble tribalism of the Green party hatchet job they were happy to publish, I'd say that the Left Unity website certainly is a joke. However the wider concept of left unity is a perfectly serious proposition. I'd go further, I'd say that a different kind of unity should be striven for, a unity of resistance and desire for fundamental reform of the political system. It should consist of a broad cross party pact to stamp out political corruption and to reform the political system and the UK economy. Voters need to be given a choice between the expenses scamming, corruption, betrayal, dishonesty and self-interest of establishment politics and a new alternative, focused upon reform and renewal of the political system. Because as it stands now, in England there is only the choice between Orthodox Neoliberal Blue, Orthodox Neoliberal Yellow, Orthodox Neoliberal Red and a few fringe parties which stand almost no chance of electoral success. This abject lack of choice and the apathy it provokes is bad for democracy, because when all three of the main English parties fundamentally agree on almost everything, there's no scope for genuine discourse and debate, which is supposed to be the essence of what democracy is all about. On Tuesday 19th March 2013 the Labour party made a catastrophic error of judgement. 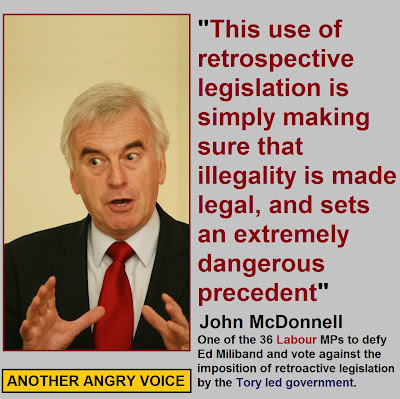 Instead of opposing Iain Duncan Smith's disgraceful retroactive lawmaking exercise, the Labour leader Ed Miliband, at the behest of the shadow DWP minister Liam Byrne, allowed the Jobseekers (BtW) Bill to sail through parliament in just one day as "emergency legislation". For some unfathomable reason the Labour leader allowed the swift passage of this legislation through a virtually empty chamber and actually whipped Labour MPs into not voting against the Tory led government's efforts to retroactively bury their mistakes. You may remember Liam Byrne as the guy who left that idiotic note for David Laws, which instead of offering some friendly advice for his successor (as was the longstanding convention) simply stated "Dear chief secretary, I'm afraid to tell you there's no money left". This was perfect ammunition for the Tory party and helped to reinforce the facile Tory mantra of "Labour wrecked the economy". Anyone would have thought that after an idiotic PR disaster like that, Byrne would have been relegated to the back benches with the rest of the right-wing Blairites. In fact he wasn't, under Ed Miliband he has actually been promoted to a more important position, that of Shadow Minister for Work and Pensions. Byrne has repeatedly talked tough on unemployment, using the right-wing tactic of blaming the unemployed for their own situation, rather than looking to the actual economic causes of mass unemployment. 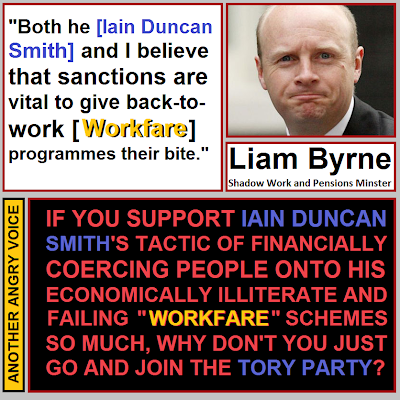 Instead of criticising Iain Duncan Smith's absurd incompetence, he backs him up with "scrounger" rhetoric. 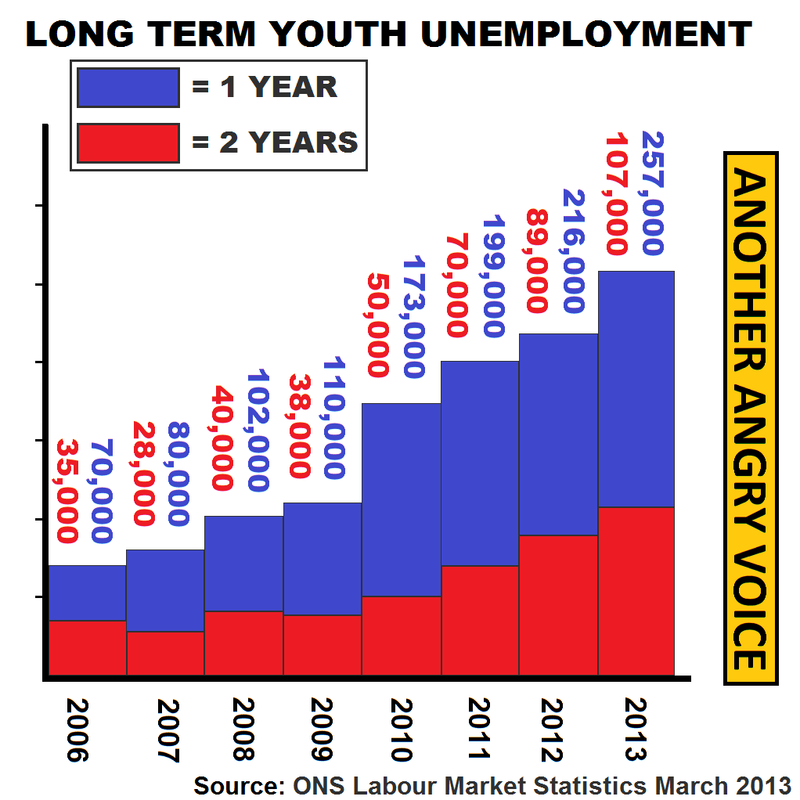 Instead of highlighting the fact that youth unemployment and long-term unemployment have risen dramatically since 2010, he assists the Tories by shifting the blame from the government to unemployed individuals. Instead of criticising the abject failure of Iain Duncan Smith's fraud riddled Work Programme, he openly supports it. "Both he [Iain Duncan Smith] and I believe that sanctions are vital to give back-to-work programmes their bite." Gone are day of the Labour party working for social justice. Instead, with ministers like Liam Byrne, they seem to be trying to out-Tory the Tories as a desperate attempt to appease the right-wing press. This tactic is doomed to failure because for every right-wing reactionary they manage to convince with their posturing, they will drive away several times as many core Labour voters. What is the point of an opposition party that don't actually oppose and even collude with the government in covering up their own blundering incompetence with retroactive legislation? I believe that Byrne's statements and his influence upon Labour policy have been an absolute disaster. 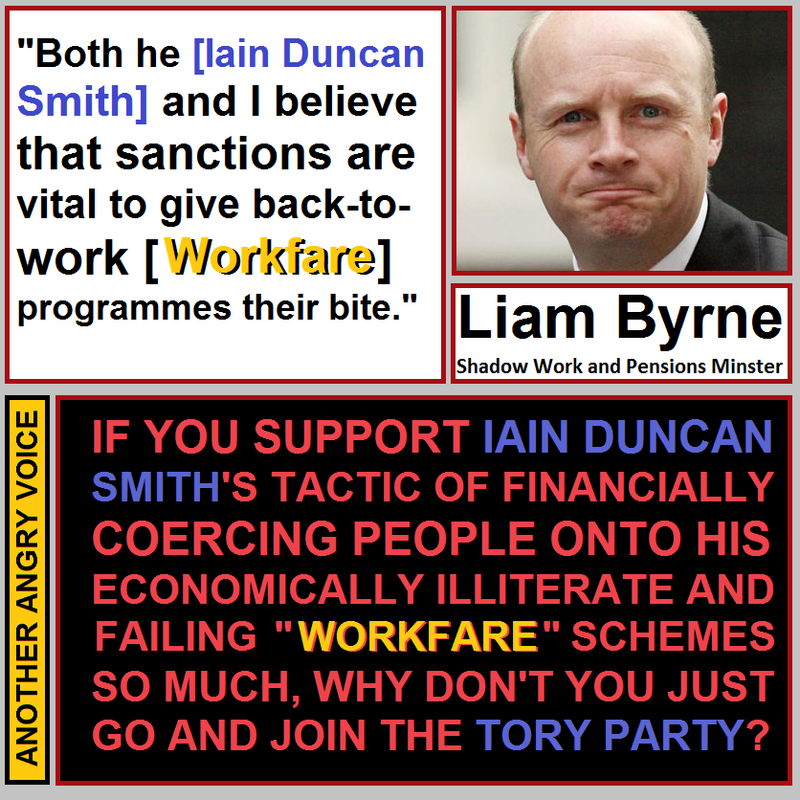 When Labour should have been lambasting Iain Duncan Smith for his incompetence, Liam Byrne put a consoling arm around his shoulder and allowed him to save his political career by retroactively rewriting his botched and unlawful regulations. With long-term and youth unemployment soaring, the Work Programme failing, the government found to be acting unlawfully by the courts and Iain Duncan Smith offering nothing but cognitively illiterate and brazenly inaccurate bluster in defence of his flawed schemes, unemployment is clearly one of the areas on which Labour should be nailing the Tory led administration to the wall. Instead, Laim Byrne and Ed Miliband have colluded with the government to help them to retroactively bury their incompetent and unlawful blundering and in doing so, saved Iain Duncan Smith's career. The best available option is for Ed Miliband is to sack Liam Byrne before he can do any more damage to the Labour party and replace him with a Labour MP with a social conscience. Some of the prime candidates for the Shadow Work and Pensions brief should be John McDonnell (who led the Labour opposition against the Tory retroactive laws), Michael Meacher (who has repeatedly demonstrated his social conscience) and Ian Mearns (who put his social conscience above his own political self-interest by resigning from the Labour front bench in order to vote against the Tory retrospective legislation). Liam Byrne is an outright liability to Labour and myself and many thousands of others would not even consider voting Labour as long as this red-tied Tory has a seat in the Labour cabinet. If you feel as strongly as I do that this guy is an absolute liability to the Labour party, why not write to Ed Miliband ( milibande@parliament.uk ) and tell him that you won't even consider voting Labour until Liam Byrne is relegated to the back benches? Just days after helping the Tory led government rush through a bunch of retrospective rule changes aimed at undermining the rule of law, denying reimbursement to thousands of people unlawfully stripped of their benefits and saving Iain Duncan Smith's political career, the Labour party decided to go on the offensive and criticise the Coalition government over leaked DWP documents referring to league tables for the number of claimants sanctioned (having their benefits withheld). Tory ministers such as Mark Hoban and Iain Duncan Smith have repeatedly made statements to parliament and to the public that there are no league tables. Here's a link to the leaked letter. "As you can see Walthamstow are 95th in the league table out of only 109 ... Our district manager is not pleased … because senior managers are under pressure to improve our office output and move up the league he has to apply some pressure downwards." She continues: "Guys, we really need to up the game here. The 5% target is one thing – the fact that we are seeing over 300 people a week and only submitting six of them for possible doubts is simply not quite credible." There are five utterly damning elements to the letter. Despite being repeatedly denied by Tory ministers, sanctions league tables clearly exist. Despite being repeatedly denied by DWP officials, sanctions targets tables clearly exist. Very senior DWP staff are aware of these league tables and targets. Very senior DWP staff have been pushing the targets. Ordinary staff and management have been threatened with disciplinary action (PIP) for not sanctioning enough unemployed people. "There are no league tables in place. We do not set targets for sanctions. I have made that point in previous discussions." 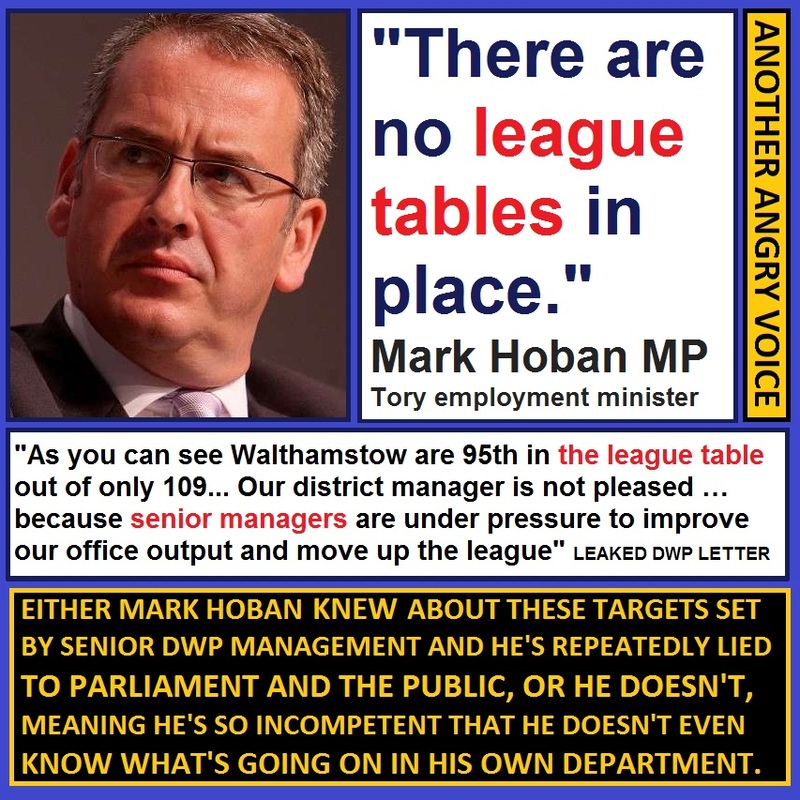 Either Hoban is aware of the league tables and targets and has repeatedly lied to Parliament and the public alike. 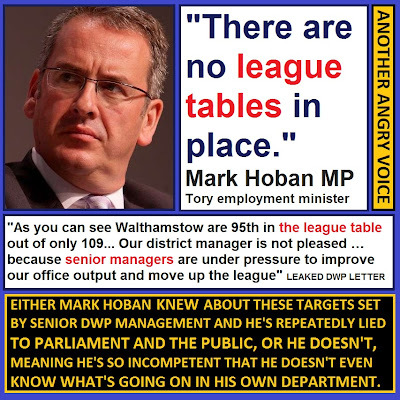 Mark Hoban is so lazy and incompetent that he doesn't have the faintest idea what senior managers within his own department are up to. That Mark Hoban and Iain Duncan Smith are incompetent liars is absolutely clear from the workfare debacle. Here's a breakdown of some of the lies and distortions Iain Duncan Smith used in a BBC interview the weekend after his workfare schemes were declared unlawful by the Court of Appeals. What is less clear is why, at the behest of the shadow DWP minister Liam Byrne, the Labour Leader Ed Miliband desperately tried to force his MPs into supporting the Tory retrospective lawmaking exercise two days before these damning documents came to light. 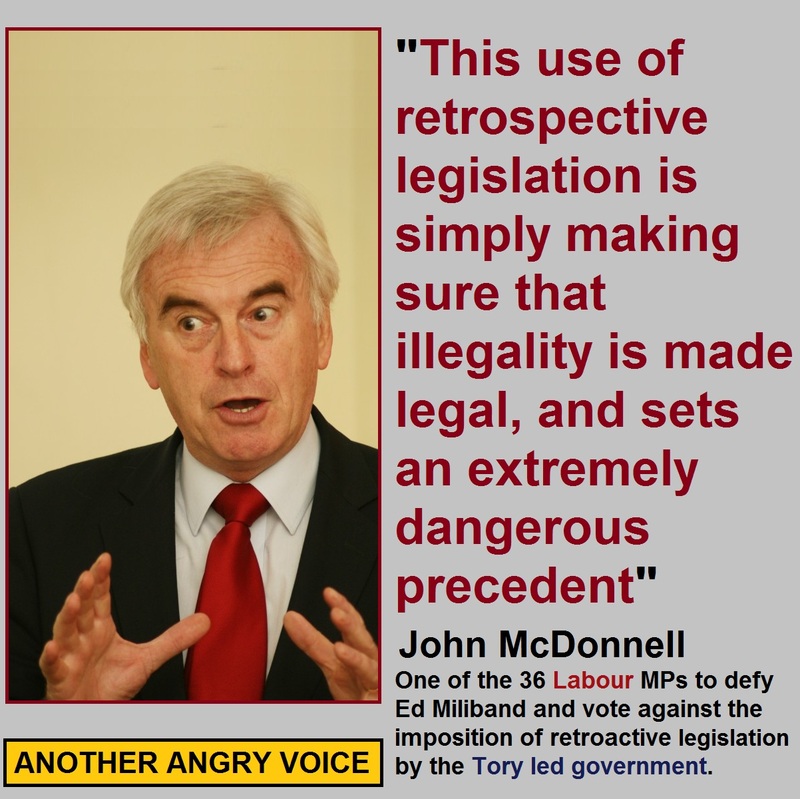 Why on earth did Miliband allow Iain Duncan Smith and Mark Hoban to rush their absurd retroactive laws through parliament as "emergency legislation" and why on earth did he try to force Labour MPs to abstain from the vote in order to allow this rotten bill to pass virtually unchallenged. Their justification narrtive is that this bill would have passed anyway, and by abstaining they got some "important concessions" is absolute nonsense of the highest order. Had Ed said no to rushing the bill through a virtually empty chamber in just one day as "emergency legislation", the debate would have gone on for weeks, allowing Labour to repeatedly slam Iain Duncan Smith for his brazen incompetence and clearly set out their own alternatives. OK the government would have probably managed to get the legislation through in the end (with the help of the spineless Lib-Dems), but they would have had to take an enormous bruising to do it. Instead of giving the popular campaign against retroactive laws time to pick up some real momentum (like the grassroots campaign against the backdoor privatisation of the NHS), Labour simply allowed the Tories to rush through their retroactive laws. Labour had Iain Duncan Smith pinned against the ropes, battered, bloodied and bruised, fighting for his political career, (largely due to his own blundering incompetence) yet for some reason they decided to leave him be and set about punching themselves repeatedly in the face instead. The only Labour MPs that come out of this with any credit at all are the 40 or so that defied the Labour whip and voted against this rotten legislation, especially John McDonnell who led the opposition to the bill and Ian Mears who resigned from his Labour shadow cabinet position to vote against the Tory led government. You can see the names of the 36 Labour rebels and the 16 other MPs (SNP, Plaid Cymru, DUP, Green party & Alliance party) that voted against the third and final reading this revolting exercise retroactive lawmaking here.